"Jean Fritz, the author of nearly 50 books for children, most of them fast-paced, vividly written works of history and biography, died May 14 at a retirement home in Sleepy Hollow, N.Y. The cause was complications from pneumonia, said her son, David Fritz." Jean Fritz had more of an affect on my life than nearly any other person, and I had never even met her. Yet, it was she who got the historical ball rolling for me. Who is Jean Fritz, you ask? Why, she is the author of the one book that inspired me like no other. I am certain that nearly everyone of us can pinpoint the time in our lives that we became history geeks. For some it may have been their first visit to Gettysburg or some other historic place that initially captured their interest and imagination. To others it was because they had a teacher in school who may have given them that spark. Me? My mom said I "came out of the womb into history" (yes, this is a direct quote). Yeah, it's true...I don't remember a time when I didn't have an infatuation for America's past; the seed was planted very early. However, I can tell you of when the "big bang" of my personal passion for times long gone occurred...that moment when my interest in the past took hold and never let go; it was when I purchased a book while I was not quite yet out of my single digit age. 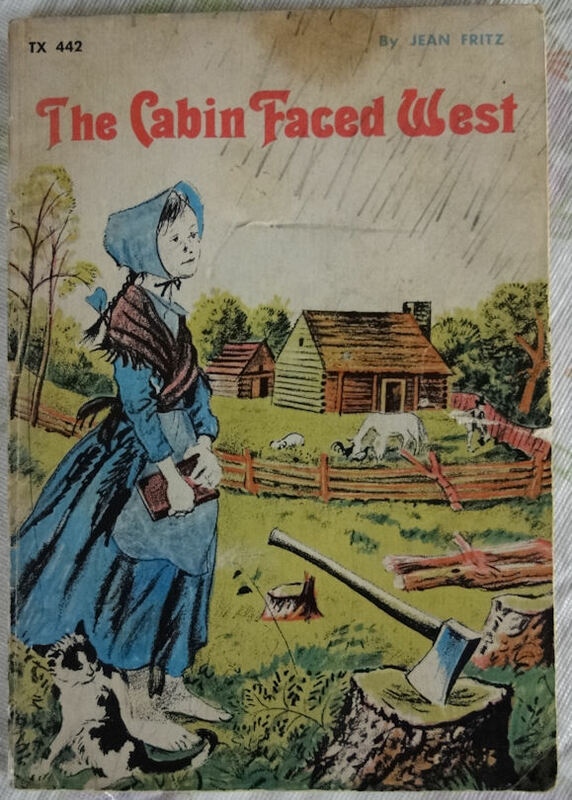 For regular readers of Passion for the Past, you may recall in other postings where I have mentioned a book about life in colonial times called "The Cabin Faced West" and how it affected me and played a pivotal role in my future in history. I bought my copy at a school book fair many years ago when I was only around nine - we're talking 1970 here. And, as a young boy I didn't care that it was a story based around a girl who was about the same age as I, for it was also about history that showed daily life, and there weren't very many like it available at that time. In school, even way back then, we were instructed to learn names of famous people (usually politicians), historic events (usually wars), and dates of said events. Though I understood the importance of knowing this information - and I did learn it - names and dates was what I was not quite as interested in. I wanted to know how people lived in the past. I wanted to read what it was like for people like me to live back then; people I may have known had I lived in those old days. I wanted to know of their everyday lives. And, as mentioned, this one book, more than any other I have read, was life-changing for me, for it directed my future course into my passion for American History. I still have my original copy and read its yellowed and brittle pages every couple of years. I still enjoy it to this day. Part of her inspiration for exploring American history came from her childhood, which was spent in China, where her parents were missionaries. "The first 13 years of my life I lived in China. My parents were missionaries there, and I was an only child. Often I felt lonely and out of place. While we lived (there), my parents often spoke fondly of their memories in the United States, and my father shared fascinating tales about American heroes. I began to form strong emotional bonds to the United States. It didn’t help that a British bully at the school she attended often taunted her about the country she scarcely knew. “Every day at recess,” Mrs. Fritz said in 1990, “that boy came up to me and said, ‘George Washington is a stinker.’ So I had to fight. I was the only one there to defend my country. I developed a homesickness that made me want to embrace not just a given part of America at a given time, but the whole of it. My interest in writing about American history stemmed originally, I think, from a subconscious desire to find roots - I felt like a girl without a country. I have put down roots quite firmly by now, but in the process I have discovered the joys of research. That was Mrs. Fritz's first historical book, and was based on a family story about her great-great-grandmother, who encountered George Washington on horseback in a remote part of western Pennsylvania and invited him to join her family for supper. Mrs. Fritz then embarked on a series of books on heroes of the Revolutionary War, followed by others on explorers, presidents and historically significant women. Her books were illustrated by a variety of artists, including Tomie de Paola and Margot Tomes. Mrs. Fritz did monumental amounts of research for her books, including visiting the places where her subjects had lived. Much of the dialogue in her books was taken from the historical record. Among other subjects, Mrs. Fritz also wrote about the Constitution and such historical figures as Benjamin Franklin, Pocahontas, Christopher Columbus, Alexander Hamilton, Paul Revere, George Washington’s mother, James Madison, Abraham Lincoln and Theodore Roosevelt. However, it was "The Cabin Faced West" that pulled me into the world of the past. It is 1784, and young Ann Hamilton is living in rural western Pennsylvania with her parents and siblings. She is lonely from being in the isolated wilderness and longs for her old friends and cousin back east in Gettysburg; she does not enjoy living on what was then the frontier. Throughout the story we see her doing her daily chores, we learn how young people entertained themselves, and even how they did schooling when there was no school building to attend. One particular part that intrigued me when I first read it was when her cooking fire went out and she had to go and "borrow" fire (a real experience of the time that I knew nothing about from my school books). 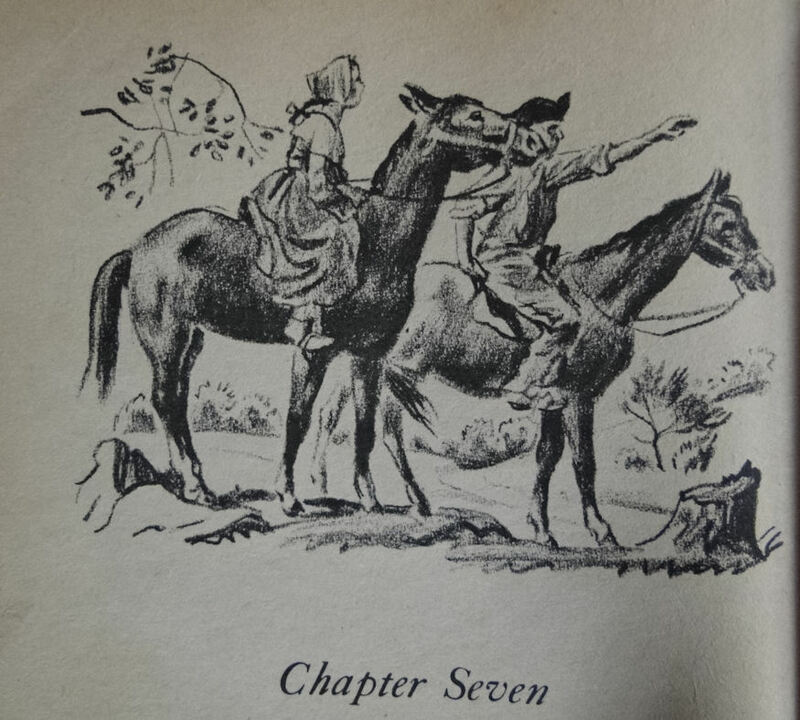 But when a great storm blows up and nearly ruins their crop - their means to survive - and when an unexpected stranger, who we find out is General George Washington, rides up the hill and stays for supper, well, you'll just have to read the book to find out what happens. Yes, this is a book meant for the younger set (good for pre-teens to young teens), but I still enjoy it to this day. The author has an engulfing way of bringing the past to life with actual historic detail. I took note of the postscript at the end of the book where the author notes that "There really was an Ann Hamilton, she was my great-great-grandmother." 18th. Set out with Doctr. Craik for my Land on Millers run (a branch of Shurtees [Chartier’s] Creek). Crossed the Monongahela at Deboirs Ferry—16 Miles from Simpsons—bated at one Hamiltons about 4 Miles from it, in Washington County, and lodged at a Colo. Cannons on the Waters of Shurtees Creek—a kind hospitable Man; & sensible. In a Scholastic Books interview, Jean Fritz was asked: Can you tell me more about your great-great-grandmother, Ann Hamilton? In the book The Cabin Faced West, did Daniel ever get married? And now this author, Mrs. Jean Fritz, has passed away at 101 years of age. I don't usually make a big deal over famous people dying, but, for me, the passing of Jean Fritz is sad in a different sort of way. Like losing a favorite teacher or a kind of mentor. Yes, her death saddens me. And because of her influence on me, it is a bigger deal than, say the death of Roger Moore. I will continue to read The Cabin faced West - my original copy, pictures at the top of this post - in honor of her. As I was researching some background information for this posting, I came across this wonderful bit of information. It’s perfect if you, like me, enjoy hearing of the befores and afters of the characters in books like this. Wow---this just made The Cabin Faced West come alive even more! William Hamilton, son of Col. Nance Hamilton, lived in York, now Adams County, Pennsylvania, the greater part of his life. There is a deed on record where he sold four hundred acres of land adjoining Gettysburg in 1765. From 1763 to 1780 he lived on his land on Marsh Creek in the same area. In 1780, he with his family, settled in Washington County, Pennsylvania, at what is now known as Ginger Hill. He died there in 1786. At the time of his death, papers of Administration were taken out by his widow, Mary, and his son, David. The bond was signed by Mary, David, John, and John Vance. The sale of his personal property was on November 7, 1786. Among those that made purchases at the sale we find the names of Mary, the widow, Mary the daughter, Daniel, David, and John, all sons; and Henry McDonough, a son-in-law. The Hamilton family came to Ginger Hill at about the same time Doctor John McMillen moved his family to the country and began to organize Presbyterian churches. The first house of William Hamilton at Ginger Hill was a little square low-ceiling one-roomed house of stone and is still standing. It was here the family first lived when they came to the western frontier. The first church built at Pigeon Creek was about 1778 and probably the first in the entire county. The first winter it was used for worship, it was neither chinked or daubed, and was without fire. It was built of round logs; roof and door of clapboards. The second church was of stone, built in 1797-1800. The cemetery at Pigeon Creek Church is among the oldest, if not THE oldest, in this section. The first burials were about 1777. It was used afterwards by the citizens of an extensive territory. Among the nearly four unmarked and unknown graves are those of William and Mary Hamilton. At one time when Gen. Washington was passing through the country with Dr. Craik, they saw a girl by the roadside picking blackberries. Dr. Craik asked her if George Washington could get his dinner at her house. She replied, "Mother is going to have only peas and potatoes for dinner; if George Washington can eat peas and potatoes, I expect Father will give him his dinner." Dr. Craik assured her that George Washington can eat peas and potatoes. The girl was our great-grandmother Ann Hamilton, and her mother was Mary Hamilton, wife of William Hamilton, of Ginger Hill. The following is quoted from the dairy of Washington, V. 2. September 18, 1784. "Set out with Dr. Craik for my land on Millers's run (a branch of Shrutees Creek), crossed the Monongahela at Davairs Ferry, 16 miles from Simpson --- baited at one Hamilton about 4 miles from it, in Washington, County, lodged at Col. Gannon's on the waters of Shrutees Creek. "Baited at one Hamiltons" was William and Mary Hamilton. William and Mary Hamilton spent the last days of their lives on a farm known as Ginger Hill in Washington County, Pennsylvania. They spent the first part of their lives in "The Manor of the Masque" in what is now Adams County, Pennsylvania, where all their children were born. Jane, the eldest daughter, married Henry McDonough, some time prior to 1786. He was born, also, in the Manor of the Masque, and is thought to have been a brother of the John McDonough who willed his property to New Orleans and Baltimore, also a brother to the Commodore Thomas McDonough. He first came to West Alexander, Pennsylvania where his wife and children were massacred by the Indians. Later he married Jane Hamilton and lived on a farm in Somerset Township until he died. Daniel Hamilton, the oldest son, took an active part in the Whiskey Rebellion in 1794. In 1796 he sold his property and moved to Kentucky with his brother, John Hamilton. Mary Hamilton married Hugh Syley soon after the death of her father. They had no children, and are buried in the old cemetery in Washington, which as long since been discarded. John Hamilton, the youngest son of William Hamilton, went to Kentucky with his brother Daniel in 1796. Collins, in his history of Kentucky, says he was known as Captain Hamilton. He died at the age of nearly one hundred years. Elizabeth Hamilton was united in marriage to William Barr and moved west where they reared a large family, many of the descendants being scattered throughout the west. Margaret Hamilton, the youngest daughter of William Hamilton, married David Bolton. They lived their lives in Washington County and reared a large family. They are buried on the Hill farm. Ann Hamilton, daughter of William and Mary Hamilton and our great grandmother was born in Adams County, Pennsylvania in 1767. She came to Washington County with her parents and lived at Ginger Hill. It was there she met Arthur Scott Jr., whom she later married. The Scotts then moved to Independence Township, Washington County, where they spent the remainder of their lives. They reared a large family and Ann outlived her husband about five years. She died at Bath, Ohio on October 5, 1848, while visiting her daughter, Mary Scott Alexander. Bath, Ohio is near the present city of Akron, Ohio. David Hamilton was the second son of William Hamilton and a brother of ann Hamilton Scott. His name occurs quite frequently in the historical records of the Whiskey Rebellion. That he took an active part in that great popular uprising is not to be denied, but there is no evidence that he approved of any of the acts of violence committed. It is know he rescued Major Kirkpatrick, a Federal Revenue Collector, from being mobbed at the time the General Melville home was burned. There are many interesting stories concerning his life, one of which is mentioned here. It would seem on the night of November 14, 1794, a Federal Revenue officer and his deputies seized a still belonging to Hamilton. The Squire, being a very shrewd Scotsman, pretended to be in no way exercised over the actions of the Government officials, he asked them to spend the night under his hospitable roof, an invitation they gladly accepted. Around the glowing backwoods fire, Hamilton and his guest discussed the excise law, the conversation being enlivened by oft-repeated draughts from, "Black Betty", which had previously been spiked with a liberal quantity of Jamaica Ginger. One by one, the officers took the count of the deep sleep of intoxication and after all of them had passed out, Hamilton speedily gathered his neighbors together and carried the whiskey and still to a place of safety. When the officers came to themselves the next morning, men and evidence were both gone. This was considered a good joke, from this, tradition has it that "Ginger Hill" derived its name. Whatever hot blood may have coursed through his veins in youth, his age presented a different story. He was a Justice of the Peace for over fifty years, was one of the Commissioners who built the turnpike running from Washington to Monongahela City, and for over fifty years he was a member in full communion in the Presbyterian Church. He died in 1839 in the eightieth year of his life. He bequeathed half of his estate to the educational charities of the Presbyterian Church. Margaret, his wife, died in 1872, age ninety-six. They are buried in the old Mingo Cemetery. Arthur Scott, Jr., was the great grandfather of Margretta Scott Brownlee. He was born in Lancaster County, Pennsylvania in June of 1761. he joined the Continental Army and served in the War of the Revolution. When sixteen years of age, he spent the winter at Valley Forge under the command of General Washington. He was sick many weeks while at Valley Forge, due to exposure and privation, and suffered the remainder of his life. At the close of the war, Arthur and his older brother, Samuel, made the journey from Lancaster to Washington, Pennsylvania, on foot. The remained a while in the vicinity of the old Pigeon Creek Church, where he met Ann Hamilton, the daughter of William and Mary Hamilton. he and Ann were married later. Arthur and Ann (Hamilton) Scott spent all their married life on this farm. Arthur had but little education, but was a great reader and an informed man. Although he lived in the day of the "Whiskey Insurrection", he took no part in it, neither did he have a still on his farm. He was an elder in the Presbyterian Church for over fifty years. He is buried in the Buffalo Cemetery close to Independence by the side of his daughter Margaret Ann. Arthur Scott Jr. and Ann Hamilton Scott reared a large family. A short sketch of each can be found in the pages following. THE WILL OF ARTHUR SCOTT JR.
. After payment of my just debts and funeral expenses, I give and bequeath to my beloved wife Ann Scott, one third of my household and kitchen furniture, , her , thirty dollars in cash from my son annually during her life, or while she remains my widow. Also thirty dollars annually to be paid by my son Samuel,l as per not given the 17th day of November, 1837, together with the in my house and the for one cow and one horse while she remains on the farm. I give and bequeath to my son, David Scott, two promissory notes given this day by my son, Samuel,l to be for one hundred dollars each, payable, one in eighteen months and the other at the death of his mother. I give and bequeath to my daughter, , one note on my son, Samuel,l for one hundred dollars due at the death of her mother.